Hittingweight is the effective mass (in grams) colliding with the ball. Hittingweight is greatest at the balance point where the effective weight equals the total weight of the racquet. Hittingweight decreases as you move away from the balance point in any direction. Hittingweight is lowest at the widest points on the racquet and near the tip. Hittingweight is the single most important contributor to the inherent power of the racquet. Hittingwieght is how heavy the impact location behaves when it is hit. It is the effective weight behind the impact, not the entire weight of the racquet. Every location has a different hittingweight. Hittingweight is a very intuitive way at looking at racquet power. The situation can be thought of as two billiard balls colliding. One ball is the 57 gram tennis ball and the other is a billiard ball of the location's hittingweight. You will find some racquets up at the tip where the hittingweight is very close to the tennis ball's weight. If it were the same, then for a non-swinging racquet, the ball would come to a complete stop and the racquet would fly off instead, just like colliding billiard balls on a straight-on collision. 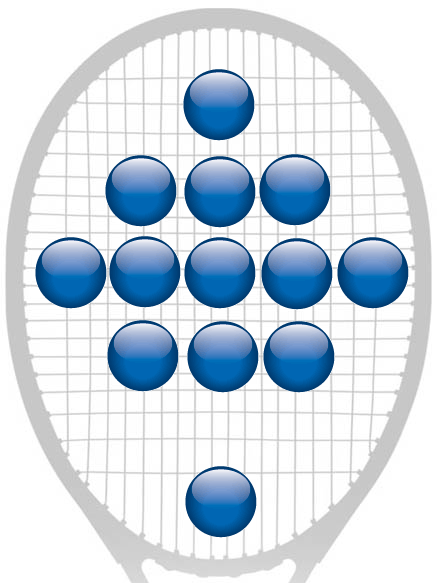 Each location on the racquet behaves differently when colliding with the ball, which is to say it moves differently. Upon collision, the racquet tends to recoil backward and rotate both around a lengthwise and widthwise axis through the balance point. The further the impact from the balance point along either axis, the faster will be the rotation about that axis. In other words, the location behaves "lighter" as is indicated by its greater acceleration. A higher swingweight will indicate less rotation around the widthwise axis and a higher twistweight will indicate less rotation around the twisting (lengthwise) axis. Hittingweight is derived from both swingweight and twistweight, it is a much more intuitive parameter for understanding racquet performance. As a rule of thumb, the hittingweight is about one-third the actual weight for impacts near the tip, about half in the center of the strings, and the full weight at the balance point. The hittingweight indicates the inherent power of the location, but the final shot speed will depend both on the power potential of the location and its speed at impact.